Both the Federal Housing Finance Agency (FHFA) and the S&P CoreLogic Case-Shiller reported on February home prices on Tuesday and both showed little moderation in the rate of appreciation. Case-Shiller’s reported gains, in fact, appear to be growing larger. Case-Shiller’s National Home Price NSA Index, covering all nine U.S. census divisions, was up 6.3 percent on a year-over-year basis. The annual gain in January was 6.1 percent. The non-seasonally adjusted index increased by 0.4 percent from February and it rose 0.5 percent after adjustment. Both composite indices increased their year-over-year results as well. The 10-City Composite rose 6.5 percent on an annual basis, one-half point greater than the December to January gain and the 20-City grew to 6.8 percent. It was 6.4 percent the previous month. Both posted price gains of 0.7 percent before seasonal adjustment and both were up 0.8 percent after. All 20 cities reported positive numbers for February both before and after seasonal adjustment. Analysts were polled for their 20-City forecasts by Econoday. The consensus was for a 6.2 percent annual increase and gains of 0.7 percent and 0.2 percent for the seasonally adjusted and non-adjusted monthly increases respectively. Seattle, Las Vegas, and San Francisco continue to have the fastest home prices of the 20 cities. Seattle led the way with a 12.7 percent year-over-year price increase, while Las Vegas was up 11.6 percent and San Francisco followed at 10.1 percent. Thirteen of the 20 cities reported greater price increases in the year ending February 2018 versus the year ending January 2018. 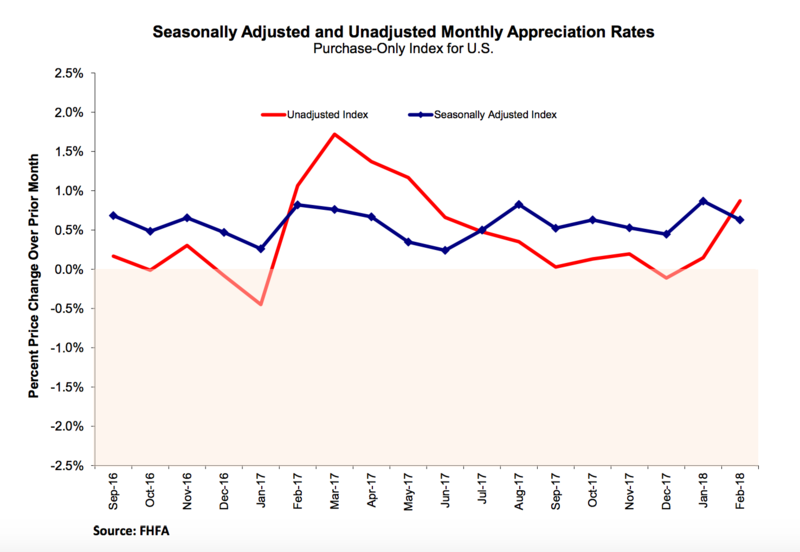 FHFA, which basis its House Price Index (HPI) on sales prices of repeat transactions financed by Freddie Mac and Fannie Mae said its index rose 0.6 percent from January to February, less than the increase from December to January. However, the January number was revised upward from 0.8 percent to 0.9 percent. On an annual basis the FHFA HPI was up 7.2 percent. This was also a small reduction from the January 2017 to January 2018 increase of 7.2 percent. For the nine census divisions, seasonally adjusted monthly price changes from January to February 2018 ranged from 0.1 percent in the West North Central division to 0.16 percent in the East South Central division. The 12-month changes were all positive, ranging from 4.8 percent in the Middle Atlantic division to 10.3 percent in the Pacific division. David M. Blitzer, Managing Director and Chairman of the Index Committee at S&P Dow Jones Indices, provided the following commentary on the his company’s February results. “Home prices continue to rise across the country. 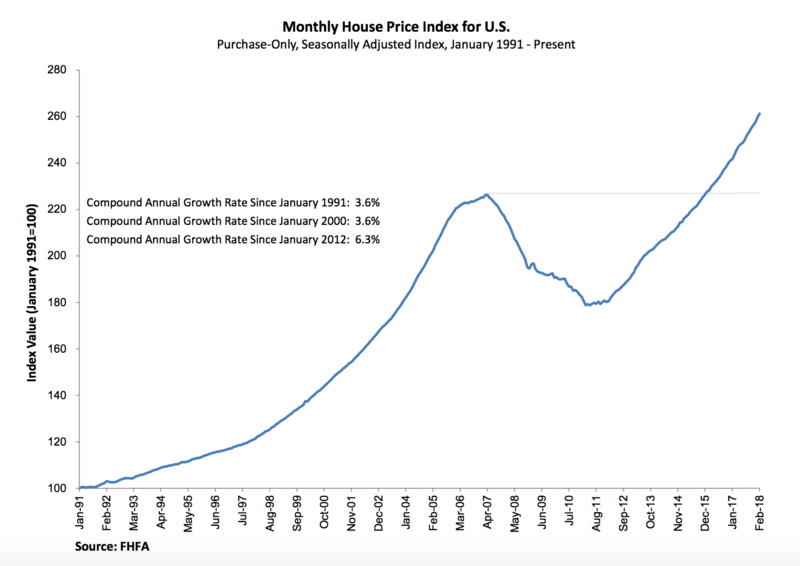 The S&P CoreLogic Case-Shiller National Index is up 6.3 percent in the 12 months through February 2018. Year-over-year prices measured by the National index have increased continuously for the past 70 months, since May 2012. Over that time, the price increases averaged 6 percent per year. This run, which is still ongoing, compares to the previous long run from January 1992 to February 2007, 182 months, when prices averaged 6.1 percent annually. With expectations for continued economic growth and further employment gains, the current run of rising prices is likely to continue. Case-Shiller puts current prices measured by all three indices at their winter 2007 levels. The National Index set another new high, up 6.7 percent from the prior peak. The 20-City Composite has now passed its July 2006 peak as well, with prices that are 0.1 percent higher. The 10-City remains 2.5 percent below its previous July 2006 record level. The National Index set another new record high in February 197.01, up from the previous month’s peak of 196.31. The 10- and 20-City Composites had readings of 220.71 and 206.67 respectively. Los Angeles claims the highest index reading at 275.98. Cleveland had the lowest reading at 117.76.